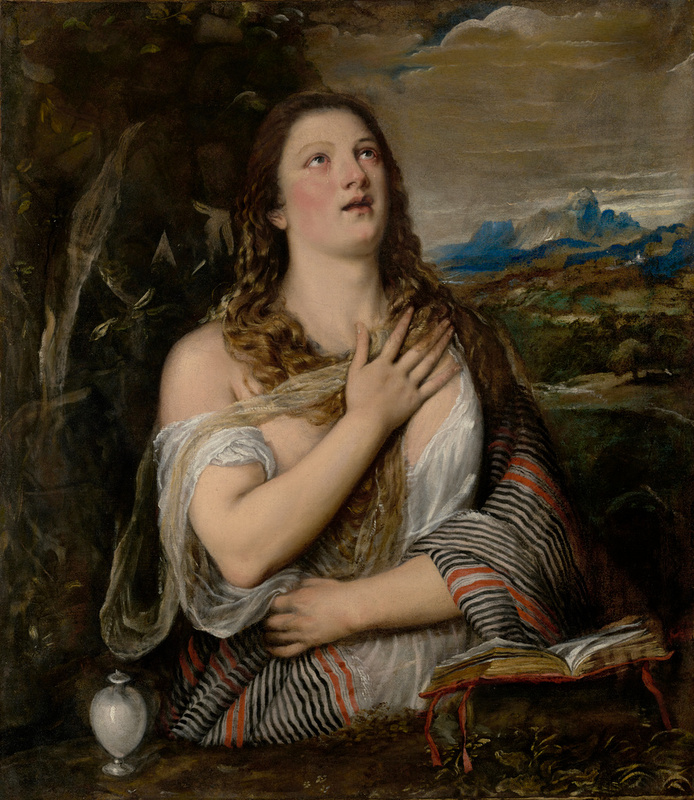 The subject of the penitent Mary Magdalene lifting her teary eyes to heaven gained great popularity in sixteenth-century Italy amongst aristocrats, religious figures and the wealthy middle class alike. Titian and his workshop created many copies and variations of this composition, at least seven of which are known today. This work is likely to have been executed with some workshop assistance. In this variation, the artist omits the skull which appears in other compositions, and instead depicts the Magdalene's Bible resting on a cloth-covered support. Such minor alterations to compositions was often made at the request a patron, who wanted a work similar to one which already existed, but unique in some way. X-rays of the painting reveal that the artist made numerous changes to the composition, known as pentimenti, suggesting that the composition was developed and altered during its execution. Sir Richard Worsley, seventh Bart., 1751 - 1805 (Appledurcombe House, Isle of Wight, England), by inheritance to his nephew, Charles Anderson-Pelham, 1805. Charles Anderson-Pelham, first earl of Yarborough, 1781 - 1846 (Brocklesby Park, Lincolnshire, England), by inheritance to Charles Anderson Worsley Anderson-Pelham, 1846. Charles Anderson Worsley Anderson-Pelham, second earl of Yarborough, 1809 - 1862 (Brocklesby Park, Lincolnshire, England), by inheritance to Charles Anderson-Pelham, 1862. Charles Anderson-Pelham, third earl of Yarborough, 1835 - 1875 (Brocklesby Park, Lincolnshire, England), by inheritance to Charles Alfred Worsley Pelham, 1875. Colnaghi (London, England; New York, New York), sold to Otto Gutekunst, 1930. Source: GRI, P. & D. Colnaghi records, private ledger, p. 311, no. 4867. Otto Gutekunst, 1866 - 1947 (London, England; Switzerland), by inheritance to his wife, Lena Gutekunst, 1947. Lena Gutekunst, sold through P & D Colnaghi & Co., Ltd. (London, England) to the J. Paul Getty Museum, 1955. Source: Provenance Index: Collectors File. Catalogue of Pictures by Italian, Spanish, Flemish, Dutch, French and English Masters [...], exh. cat. (London: British Institution, 1850), p. 8, no. 17. Waagen, Gustav Friedrich. Treasures of Art in Great Britian: Being an Account of the Chief Collections of Paintings, Drawings, Sculptures, Illuminated Mss., &c., &c. 3 vols. (London: John Murray, 1854), vol. 2, p. 87n. Exhibition of Works by the Old Masters and by Deceased Masters of the British School, Winter Exhibition, exh. cat. (London: Royal Academy, with William Clowes and Sons, 1875), p. 15, no. 136. Cavalcaselle, Giovanni Battista, and Joseph Archer Crowe. Tiziano: La sua vita e i suoi tempi. 2 vols. (Florence: Successori Le Monnier, 1877-78; repr. Florence: G. C. Sansoni S. p. A., 1974), vol. 2, p. 291. Crowe, Joseph A., and Giovanni B. Cavalcaselle. The Life and Times of Titian: With Some Account of His Family. 2 vols. 2nd ed. (London: John Murray, 1881), vol. 2, pp. 315-16.
de Rinaldis, Aldo. Pinacoteca del Museo Nazionale di Napoli: Catalogo. New ed. (Naples: Richter & Co. Editori, 1928), p. 340. Christie, Manson & Woods, London. Catalogue of Important Pictures by Old Masters, the Property of the Right Hon. the Earl of Yarborough [...] Capt. the Hon. Marcus Pelham [...] and [...] the Earl of Feversham. July 12, 1929, unpaginated, lot 102. Borenius, Tancred. "Von der italienischen Ausstellung in London." Pantheon 5 (January-June 1930), p. 145, ill.
Mayer, August L. "The Yarborough 'Magdalen' by Titian." Apollo 11 (January-June 1930), pp. 102-3. Suida, Wilhelm. Tizian (Zurich and Leipzig: Orell Füssli, 1933), p. 133. Arslan, Edoardo. "Titian's 'Magdalen.'" Burlington Magazine 94, no. 596 (November 1952), p. 325n1. Poirier, Pierre, ed. La peinture vénitienne, exh. cat. (Brussels: Palais des Beaux-Arts, with Éditions de la Connaissance S. A., 1953), p. 60, no. 112, fig. 51. Garlick, Kenneth. "Italian Art in Birmingham." Connoisseur 136, no. 547 (September 1955), pp. 38-39, ill.
Italian Art From the 13th Century to the 17th Century, exh. cat. (Birmingham: City of Birmingham Museum and Art Gallery, 1955), p. 41, no. 106. Valentiner, William R., and Paul Wescher. The J. Paul Getty Museum Guidebook. 2nd ed. (Los Angeles: J. Paul Getty Museum, 1956), pp. 20, 24n5, fig. 22. Masterpieces of Art: In Memory of William R. Valentiner, 1880-1958, exh. cat. (Raleigh: North Carolina Museum of Art, 1959), pp. 28, no. 38, 61, ill.
Valcanover, Francesco. Tutta la Pittura di Tiziano. 2 vols. (Milan: Rizzoli, 1960), vol. 2, p. 72. Konstens Venedig: Utställning anordnad med anledning av Konung Gustaf VI Adolfs åttioårsdag, exh. cat. (Stockholm: Nationalmuseum, 1962), pp. 97-98. Nicolson, Benedict. "Venetian Art in Stockholm." Burlington Magazine 105, no. 718 (January 1963), p. 32. Fredericksen, Burton B. A Handbook of the Paintings in the J. Paul Getty Museum (Malibu: J. Paul Getty Museum, 1965), pp. 13-14, pl. 7. Getty, J. Paul. The Joys of Collecting (New York: Hawthorn Books, Inc., 1965), pp. 31, 92, ill.
Torriti, Piero. La Galleria del Palazzo Durazzo Pallavicini a Genova (Genoa: Sigla Effe, 1967), p. 201. Cagli, Corrado, and Francesco Valcanover. L'opera completa di Tiziano (1969; repr., Milan: Rizzoli Editore, 1978), p. 132, no. 459 (provenance of 56.PA.1, erroneously wrong title and location, different painting illustrated). Pallucchini, Rodolfo. Tiziano. 2 vols. (Florence: G. C. Sansoni Editore, 1969), vol. 1, pp. 180, 193, 324, no. 522. Pallucchini, Rodolfo. Tiziano. 2 vols. (Florence: G. C. Sansoni Editore, 1969), vol. 2, fig. 522. Wethey, Harold E. The Paintings of Titian: Complete Edition. Vol. 1, The Religious Paintings (London: Phaidon, 1969), p. 149, no. 129, fig. 236. Béguin, Sylvie, and Francesco Valcanover. Tout l'oeuvre peint de Titien (Paris: Flammarion, 1970), p. 132, no. 459 (provenance of 56.PA.1, different painting illustrated), no. 605. Waterhouse, Ellis Kirkham. Notebooks. Vol. 58 (Los Angeles: Getty Research Institute), accession no. 870204, p. 222 (Dec. 10, 1970). Fredericksen, Burton B. Catalogue of the Paintings in the J. Paul Getty Museum (Malibu: J. Paul Getty Museum, 1972), pp. 34-36, no. 36, ill.
Fredericksen, Burton B., and Federico Zeri. Census of Pre-Nineteenth-Century Italian Paintings in North American Public Collections (Cambridge: Harvard University Press, 1972), p. 202. Fredericksen, Burton B., ed. The J. Paul Getty Museum: Greek and Roman Antiquities, Western European Paintings, French Decorative Arts of the Eighteenth Century (Malibu: J. Paul Getty Museum, 1975), p. 90, ill.
Wallace Paris, Katherine, ed. Gloria dell'arte: A Renaissance Perspective, exh. cat. (Tulsa: Philbrook Art Center, 1979), no. 149, ill.
Heinemann, Fritz. "La Bottega di Tiziano." In Tiziano e Venezia: Convegno internazionale di studi, Venezia, 1976 (Vicenza: Neri Pozza Editore, 1980), p. 409n12. Mason Rinaldi, Stefania. Palma il Giovane: L'opera completa (Milan: Alfieri, Gruppo Editoriale Electa, 1984), p. 175, under no. A 104. Biadene, Susanna, ed. Titian: Prince of Painters, exh. cat. (Venice: Palazzo Ducale, with Prestel, 1990), p. 334, under no. 62, entry by Irina Artemieva. Jaffé, David. Summary Catalogue of European Paintings in the J. Paul Getty Museum (Los Angeles: J. Paul Getty Museum, 1997), pp. xiv, 125, ill.
Goffen, Rona. Titian's Women (New Haven and London: Yale University Press, 1997), pp. 187, 190, fig. 106. Rearick, W. R. "Le 'Maddalene penitenti' di Tiziano." Arte Veneta 58 (2001), pp. 34-36, 41n36, fig. 12. Rothe, Andrea. "Titian's Penitent Magdalen in the J. Paul Getty Museum." Studi tizianeschi, no. 1 (Spring 2003), pp. 39-42, figs. 19-20, 22-23. Falomir, Miguel. "Tiziano: réplicas"/"Titian's Replicas." In Tiziano, exh. cat. Miguel Falomir, ed. (Madrid: Museo Nacional del Prado, 2003), pp. 81, 327. Schaefer, Scott. Titian and the Commander: A Renaissance Artist and His Patron, exh. brochure (Los Angeles: J. Paul Getty Museum, 2005), unpaginated, fig. 5. The J. Paul Getty Museum Handbook of the Collections. 7th ed. (Los Angeles: J. Paul Getty Museum, 2007), p. 101, ill.